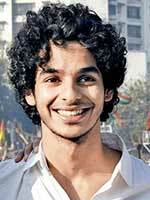 Ishaan Khatter was born on 1 November 1995 and is the half-brother of actor Shahid Kapoor. He is the son of Rajesh Khatter and Neelima Azeem. He finished schooling from Billabong High International school and college from RIMS International School and Junior college. He trained and honed his dance skills at Shiamak Davar dance academy. He made his acting debut as a child with the 2005 movie Vaah Life ho toh Aisi. He was also the assistant director of the movie Udta Punjab in the year 2016. His international and Bollywood debut as an actor is 2017/2018 movie Beyond the Clouds.